The ITG Plant Enzyme formula is a combination of the most important enzymes for digestion of proteins, fats, and carbohydrates – including lactase for the digestion of the milk sugar lactose. In order to assimilate vitamins and nutrients from our food and supplements we must be able to digest them properly. Studies show that foods in the typical American diet are devoid of natural enzymes and do little to help secrete our own production of enzymes. So, foods are not digested well and nutrients from food are poorly absorbed. Poor digestive health can lead to many other disorders including asthma, osteoporosis, food allergies, depression and arthritis. Many health experts agree that regular consumption of enzymes and enzyme rich foods is a key to vibrant health, disease prevention, and anti-aging. Every cell in your body needs enzymes for its biochemical functions, thus a deficiency will accelerate the aging process! 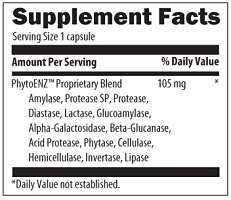 Plant Enzyme Digestive Formula does not contain any animal products. This formula is presented in vegicaps and is suitable for vegetarians.